They had a table of books out on display at our local library this week. I perused through, thinking, "These all look great" and then realised they all had 'withdrawn' stickers on them. They were for sale for 60c each! I still wanted to read them though, so forked out my $1.80 and brought them home. 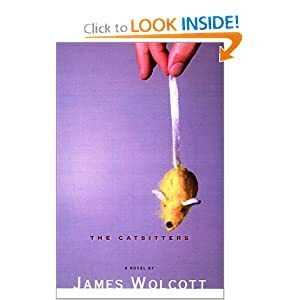 One was rubbish and deserved to be withdrawn, but The Catsitters, by James Wolcott was engaging enough for me to continue on through. It's an old book now, published in 2001, but I didn't really notice. The book follows the love life of confirmed bachelor and actor/bartender Johnny Downs who takes advice on how to get the girl of his dreams from his Southern friend Darlene through a series of witty phone calls. Darlene decides to make Johnny more 'marriageable' so that he'll attract and keep quality women and sets him on a path of such life changes as getting rid of the bacheloresque juke box in his apartment and buying a new shower curtain. When Downs' ideal romance comes to an end it seems Darlene has had a hand in it and he finds out that his phone buddy is more interested in conducting social experiments than actually helping a friend find love. I was disappointed in the ending. I wanted Johnny and Darlene to end up together but it wasn't to be. What I liked was the relationship, the dialogue and the 'rules of the game' so beautifully articulated by Darlene. The Catsitters was chick lit but with a male main character and unlike anything I've read in a while. Apparently the author is well known to readers of Vanity Fair. Do I look uncool and unsophisticated if I say I've never heard of him? Probably, but that's okay. I'd certainly go find another of his novels.